A few days ago, I gushed over London’s more modern theaters and how comfortable, democratic, and eclectic spaces are essential in creating a vibrant theater community. Creativity, comfort, and accessibility are all things we look for in a modern theater, both in its physical structure and in the works it produces. Well, London also has some theaters that are older than dirt. I mean, older than the queen herself. I mean, older than she’s ever going to get (bless Prince Charles). I mean, older than the way I feel around Vampire Diaries fans. 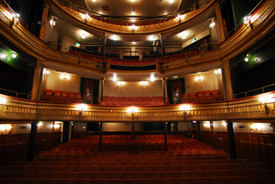 Theatre Royal, Drury Lane is the oldest and most famous theater in London, and when you climb up those stairs to the balcony, you might understand what it feels like to be 400 years old. In these old theaters, the views from the cheap seats make it seem like you’re watching a play from the seat of an airplane that already took off. And there’s about as much space for your legs as in an airplane too. The revival of Mojo, an early play by Jez Butterworth who has since found success with Jerusalem, is being performed at the Harold Pinter Theater, before known as The Comedy Theater, which is one of those old theaters that make you really focus on the play so that you don’t focus on the fact that you might very well slam your elbow into your neighbor’s shoulder by accident throughout the evening. My seat was in the late-mid alphabet section of the stalls (orchestra for Brits), which in New York, would likely mean a clear enough view of the stage, maybe a bit cut off from the overhanging balcony. These Mojo seats were not only under a hanging balcony that cut off part of the above action, there was a pillar right in our views. And as if all this wasn’t alienating enough, the play used so much British slang and heavy accents that I needed to buy a playbill in the intermission with the hopes of finding a summary of what I just saw. Yup, you have to buy playbills. They’re called programmes and they’re usually about three pounds a pop. They come with lots more behind-the-scenes info than Boroadway playbills though, and relevant articles. My Mojo programme didn’t have a summary so I was stuck with only my experience piecing together Kelly’s heavy Derby accent from Misfits. Also, you can buy ice cream during intermission, which arouses all the infantile excitement I’ve repressed since elementary school. When a local pop star goes missing at the hands of a gangster in the 1950’s London music scene, a club owner and his terrified crew prepare themselves for confrontation… That’s about as much as I can say about the plot. Everything else that I actually understood would be spoilerific. The rest was in this weird other English language that no one on BBC America actually speaks, so I’m screwed. The play assembles an all-star cast to play the bumbling, unfortunate gang. Harry Potter‘s Rupert Grint plays nice-guy Sweets and provide a funny heart for the play. Merlin‘s Colin Morgan and Downton Abbey‘s Brenday Coyle also lend some star power in their roles. The cast works together extraordinarily well and keep a constant, darkly comedic momentum going. I was most excited to see Ben Whishaw play Baby. He’s definitely one of the most versatile and captivating actors around, and has the ability to pack his graceful and vulnerable exterior with an emotional punch. Plus, I wrote my first published review (*cough* in the school newspaper *cough*) about The Pride at the Manhattan Theater Club, which starred Whishaw and Hugh Dancy. Good times. These are my exact sentiments about Mojo! I originally bought those dreaded pillar seats online and the moment I figured it out, I called the box office to reassign my seats. Definitely try to meet the cast before they leave!